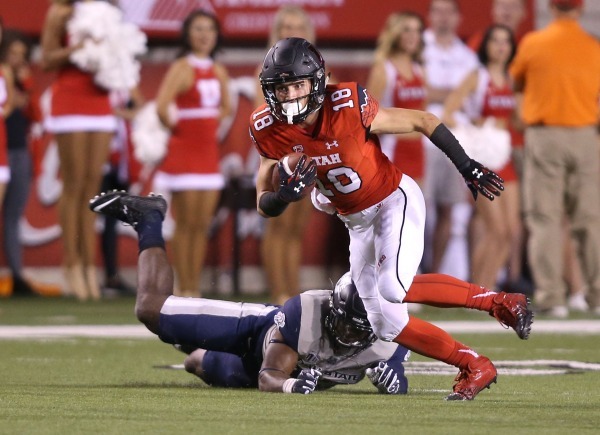 COMMENTARY — I am tempted to talk about the “Battle of the Brothers” as one of the storied rivalries in college football dating back to 1892, and the fact that precious few Ute fans would admit that the Cougars are their brothers, but it seems to work with the Aggies. Instead, I want to jump right into talking about who, in my humble opinion, was the undisputed star of the game last Friday night — Utah freshman Britain Covey, who just happens to be the grandson of notable author Stephen R. Covey (made famous by his “7 Habits of Highly Effective People”). Therefore, with a wink and a nod to Grandpa Covey, I’d like to present the 7 Habits of Highly Effective Football Teams. 1. Have a stud freshman receiver/returner who is 166 pounds of pure fury. Britain Covey plays much bigger than his diminutive 5’8” 166 pound frame. Very rarely is the first defender to encounter him able to put him on the turf. Make no mistake, Covey is shifty, elusive and hard to catch. However, he plays with attitude, can take a hit, and refuses to go down without a fight. In the very first series of the game, Covey took a shot to the head that laid him out, and resulted in the defender getting ejected from the game for targeting. No one would have been surprised if Covey had not returned to the game. But he did. And he didn’t just return, he played, and played big. Covey led all Utah receivers in catches (6) and receiving yards (61), and no one else was even close (fellow freshman Tyrone Smith came in a distant second with 2 catches for 19 yards). At the start of the fourth quarter, Covey refused to fair catch a punt in traffic, and ended up returning it 30 yards, when it should have gone nowhere. The gee whiz fact of the week is that Covey remains undefeated in Rice Eccles Stadium, having run the table as a prep, quarterbacking Timpview to a high school championship, and now he is 2-0 as a Ute. I am hopeful that streak will continue. 2. Have lots of quarterbacks available to play. Three Utah quarterbacks played against Utah State: Travis Wilson, Chase Hansen and Kendal Thompson. Wilson started the game, but left after being injured on a running play late in the first half. Thompson took over the reigns for the remainder of the game. Early on (prior to Wilson’s injury), Hansen stepped in for a designed third-down play. Sophomores Conner Manning and Brandon Cox were also chomping at the bit on the sideline hoping for an opportunity to play. Gone are the days when John Hays or Adam Schulz were the best options available when the starting quarterback went down with an injury. 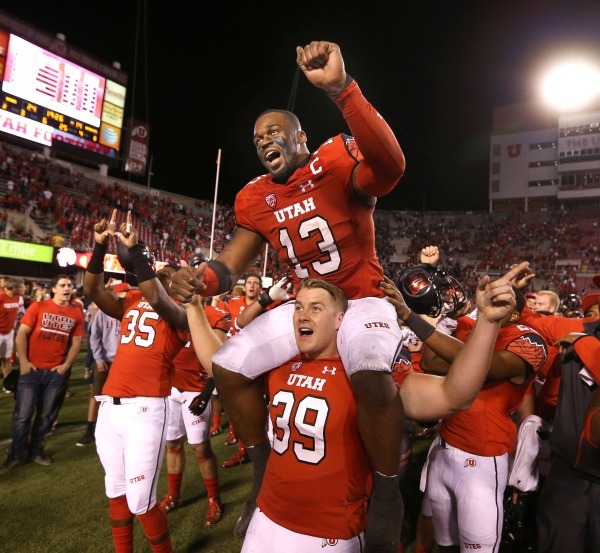 The Utes have a stable of quality quarterbacks at their disposal if the need arises. As for who starts next week, well, as usual Whittingham isn’t saying. 3. Cause more turnovers than you commit. In the first two games of the season, Utah has given up a single interception, while racking up a total of five interceptions and a fumble recovery to boot. If the Utes can continue that trend, especially in Pac-12 play against a very difficult South Division schedule, then they are going to be competitive in every single game regardless of the opponent. 4. Get big stops when you need them. Let’s face it, you simply can’t hold an opposing offense to zero yards gained, and rarely can you pitch a shutout. However, the key is to get big stops when you need them. Late in the first half, with Utah up by a single score, Utah State had advanced the ball past midfield, then proceeded to gain nine yards on first down. The Utes held firm on both second and third downs, forcing the Aggies to punt. Gionni Paul’s spectacular tackle at the line of scrimmage on third down gets my vote for the hit of the game. Paul hit the runner high and took him completely off of his feet, not unlike the result when a cowboy ropes a calf (and I almost expected Paul to tie the runner’s ankles together with his shoelaces, throw his hands in the air and back off for the requisite 6-second period to see if the knot would hold). You’re playing with fire if you try to make a living by consistently going for every fourth down, and you have to be smart about when you do go for it on fourth. And then you have to make it. With the score tied in the third quarter, Utah converted a fourth down just barely across midfield that kept the drive alive. The drive ended with Kendal Thompson scampering into the end zone for a touchdown to give the Utes a lead it would not relinquish for the remainder of the game. 6. Have a great home crowd. Rice Eccles Stadium is a pretty hostile environment for opposing teams. Utah’s student section, the MUSS, provides a lot of noise and energy (which contributed to two costly false starts by Utah State in front of the MUSS in the second half), but the rest of the crowd is enthusiastic and loud as well. 7. Don’t just play well, but look good doing it. Utah goes on the road this week at Fresno State. Here’s hoping the Utes continue to look marvelous and return home 3-0 and moving up in the rankings.